Pegasus Park Equestrian Centre is one of Byron Bays oldest horse riding ranches – established in 1994. Founded on a love of horses, horse riding, nature and a passion for sharing their enthusiasm, Pegasus Park Equestrian Centre continues to provide quality instruction coupled with beautiful, well cared for and educated horses, to provide you with a wonderful horse riding experience. You will find our ranch nestled in the hills of Byron Bay (approximately half way between Byron and Ballina) and only minutes from Bangalow. From Byron Bay, you take the Hinterland Way to Bangalow than follow the Lismore Road for approximately 3kms. Stock horses and ponies for the smaller children. Once you arrive at the Pegasus Park horse riding ranch we will introduce you to a horse that suits your riding abilities. Our horses are well trained and all rides and lessons are well supervised. We hope you have a great and safe time with our lovely horses. You will learn how to setup, care and mount your horse. You will also learn the commands to interact with your horse and finally you will put the concepts you learnt into practice with a hinterland ride on your assigned horse. Don’t worry if this seems like a lot to take in whilst trying to learn to ride, our dedicated and experienced instructors will be there to assist you. Once riders are ready it is time to check out the Byron hinterlands on horse back. The ride takes you along the Byron creek, where if you are lucky you can even see the platypus, as well as other notable locals like the turtles, ducks and fish. The group then makes its way to the top of Gordon’s Hill. Here we take photos of the ride and the fantastic views of Byron hinterland. You can check out some examples on our Facebook page. We want you to have your own memories too so we also take photos with your cameras as well. If you are already have some experience riding horses and just want to get out and about in the fantastic hinterland behind the ranch, check out our Private Trail Ride, which cater more for intermediate and advanced level riders. A great way to spend the day is on horse back, riding in the pristine hinterland of Byron Bay. As with most outdoor activities, horse riding requires a small level of physical fitness so you can comfortably enjoy your experience. We want to make sure you, as well as our horses are comfortable and safe during our our rides and lessons, as such please note there is a weight limit of 100kgs. All cancelations and booking changes must be made via phone. (02) 66871446. A minimum of 24 hrs notice is required for cancellations. The 1/2 Day Hinterland Tour is a great way to be introduced to fantastic fun of horse riding or to simply get back on the horse again. For those looking for an introduction to horses, horse care as well as horse riding, then this is a great package for you. Learn how to groom, saddle and ride. 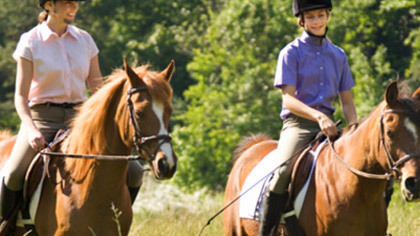 Learn – Discover the basics about horse riding with the included free lesson. Ride – Put your new skills to the test with a stunning 1hr 30 mins (approximate) Hinterland ride. Care – Learn how to care for your horse inclusing saddle, unsaddle & wash down.